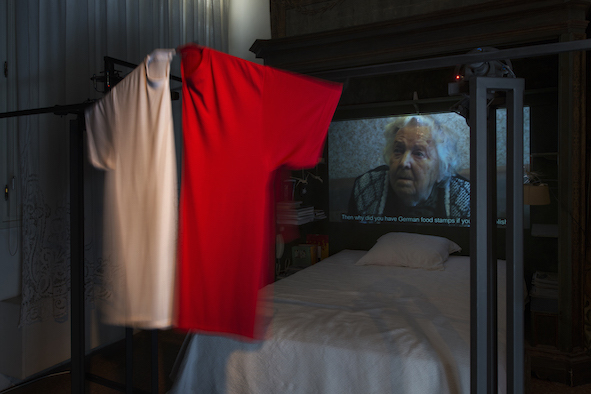 "A kinetic contraption, with four coloured T-shirts hanging from its mechanical limbs, performs an awkward choreography in the Palazzo Donà Brusa. Two T-shirts – red and white, folded in complementary halves – are thrust toward each other, then fall still. Side by side they signal a Polish flag, but also a torso or body made provisionally whole. Soon the machine jerks into action again, pulling the emblem apart to produce new configurations. A German flag appears when black and yellow T-shirts are combined with the red. More often than not, however, the colours are suspended in a fragmented state, awaiting instruction..."
A kinetic contraption, with four coloured T-shirts hanging from its mechanical limbs, performs an awkward choreography in the Palazzo Donà Brusa. Two T-shirts – red and white, folded in complementary halves – are thrust toward each other, then fall still. Side by side they signal a Polish flag, but also a torso or body made provisionally whole. Soon the machine jerks into action again, pulling the emblem apart to produce new configurations. A German flag appears when black and yellow T-shirts are combined with the red. More often than not, however, the colours are suspended in a fragmented state, awaiting instruction. The instruction comes from a single-channel video projected onto the headboard of a heavy letto matrimoniale (double bed) placed in the middle of the room. 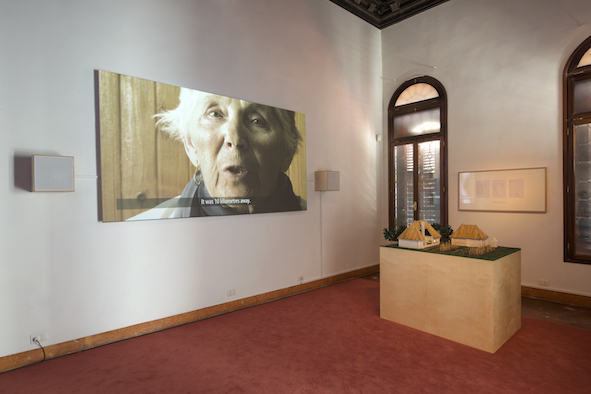 In the video, the artist Tomasz Opania interviews three of his family members about their national belonging; his nonagenarian grandmother Jadwiga Heller, his aunt Ruta Kamela (née Breitkopf) and his mother Barbara Opania (née Heller). Their answers are contradictory, vacillating between identification with Poland and with Germany; the factors that determine these identifications are never established conclusively. ID cards, food stamps, language and schooling are proffered, but ultimately fail to produce a consistent narrative. The family is from Silesia, a modern-day industrial region with a mottled history of Bohemian, Prussian, and German claimants that became Polish immediately after the Second World War. ‘When Poland came,’ says ninety-nine-year-old Heller matter-of-factly, ‘we were all Polish and no-one was German anymore’. The contraption swivels its colours to adjust the flags accordingly. 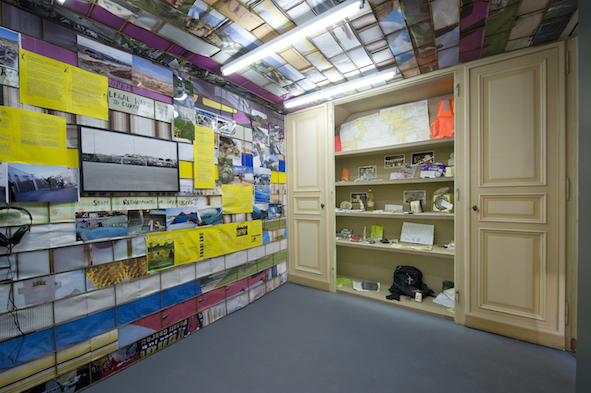 Opania’s piece, Illegal Border Crossing – grüne Grenze (2015) is part of the exhibition Dispossession, a collateral event of the 56th Venice Biennale. It is organised by European Capital of Culture Wrocław 2016, and takes as its prompt Wrocław’s turbulent history of displacement. The largest city in Lower Silesia, Wrocław underwent major changes of governance in the twentieth century. As Breslau, it was the capital of the Weimar province of Niederschlesien in the interwar period and then, at the close of the Second World War, it was Festung Breslau under Soviet siege. In 1945 Breslau became Wrocław, part of Poland along with most of Silesia, resulting in the abrupt expulsion of the city’s mostly German population and a concomitant influx of Polish settlers.1 The curators of Dispossession, Michał Bienek and Małgorzata Miśniakiewicz, premise their choice of artists on this history, tracing an axis from Lviv in Ukraine, via Wrocław in Poland, to Dresden in eastern Germany. In the east as in the west, the borderlands – the Kresy – were subject to drastic demographic change following the war. Annexed by the Soviet Union following the 1939 Molotov-Ribbentrop Pact, then forming part of independent Lithuania, Belarus, and Ukraine in the post-1989 moment, the Kresy occupy to this day a romaticised position in the Polish imagination as ‘lost lands’. Dispossession is not a lesson in national history. It explores instead the kinds of belonging that are possible when traditional markers of nationhood fall short; when borders move but bodies do not; or when lives are expelled from the places they have called ‘home’. It probes a fundamental ambiguity that seems inherent to the concept of a ‘people’; on the one hand, a ‘people’ may be taken to describe the citizens of a nation-state, a group whose existence is politically recognised and whose rights are institutionally sanctioned. On the other hand, ‘people’ can be taken to mean that multiplicity of lives which is excluded from politics in practical if not in legal terms. This ambiguity, observed by Giorgio Agamben, produces a ‘biopolitical fracture’ in the notion of the people; one he seeks to draw out by dividing the term into People and people. In Agamben’s analysis, the People represents ‘one pole, the total state of the sovereign and integrated citizens’, while the people denotes ‘the other pole, the banishment – either court of miracles or camp – of the wretched, the oppressed, and the vanquished’.2 In Dispossession the vicissitudes of this latter people come to the fore, putting the notion of citizenship – and of a coherent national identity along with it – under considerable stress. Opania’s makeshift torsos, flagging their ‘banal nationalism’ like so many football jerseys,3 become increasingly absurd in their ever-changing constellations, pitiful in their inability to represent bodies that belong. Tomasz Opania, Illegal Border Crossing – grüne Grenze, 2015, video and object, dimensions variable, collection of the artist, photo: Małgorzata Kujda. The Open Group, Backyard, 2015, multimedia and video installation, dimensions variable, collection of the artists, photo: Małgorzata Kujda. It is the somatic experience of space and its relationship to the construction of ‘home’ that occupies the artists of Ukrainian collective The Open Group in their piece Backyard. Backyard centres on the stories of two women: Filomena Kuriata, whose home in rural Volhynia – a part of modern-day Ukraine, but Polish before the Second World War – was destroyed during the German invasion and the Volhynia massacres; and Svetlana Syoeva, who was recently forced to leave her home near Donetsk in eastern Ukraine following fighting in the Donbas. In two videos, The Open Group sets about re-creating 3D models of these lost homes under Kuriata’s and Syoeva’s guidance, which is often hesitant and difficult to interpret. Language proves inferior to sensual association; Kuriata cannot give the precise location of the trees in the pear orchard outside her home, but remembers the taste of the fruit some seventy years on (‘I dreamed a lot of these pears and that meadow’). When questioned about her home, Syoeva repeatedly rises from her chair to indicate proportions and distances in relation to her own body. The resultant architectural models, accompanied by explanatory drawings, are displayed alongside the videos. Plastic and pristine, these uninhabitable homes resonate with Szymon Kobylarz’s Ms Anna (2015), an installation occupying the upstairs bedroom of the sometime residential palazzo. Here, we encounter the hyperrealistic figure of Ms Anna, a generic placeholder for a Ukrainian housekeeper in a Polish middle-class home. The domestic setting is insipidly Pinterest-friendly; airbrushed stock images populate picture frames, while Ms Anna looks on despondent. In Poland, the largest employment sector among female migrants from Ukraine is housekeeping; vague infographics detailing these statistics are hidden by Kobylarz in the space. The condition of Ms Anna’s displacement, we understand, is that she is fated to reproduce domesticity for a living while denied an affective attachment to her own home. Szymon Kobylarz, Ms Anna, 2015, sculpture and site-specific installation, dimensions variable, collection of the artist, photo: Małgorzata Kujda. Examining the condition of bare life – life reduced to the mere fact of being alive (zoē, whereof ‘zoology’) and thereby ‘exposed to the state’s unmediated application of power’,4 as opposed to politically recognised existence (bios, whereof ‘biology’)5 – has been a pressing concern in art practice and discourse for the past decade and a half.6 Dispossession makes this its critical project too, addressing not only the fundamental experiential ambivalence of historic displacements in Central and Eastern Europe, but also the predicament of contemporary refugees. In her installation Reisefieber, Dorota Nieznalska has constructed a train carriage out of reclaimed doors from formerly German cities, now in Poland: Danzig/Gdańsk, Bromberg/Bydgoszcz, Schweidnitz/Świdnica, and so on. The structure takes the form of a mid-century cattle wagon, a mode of transport used for Holocaust deportations, but also – and Nieznalska’s intention is to remind us of this – for the millions of German nationals (the exact numbers are disputed) expelled from western Poland in the aftermath of the war. The reclaimed doors are German, but their place of origin is no longer a political reality. Their material existence produces a form of phantom nationality that becomes an apt emblem for people caught in between Peoples. 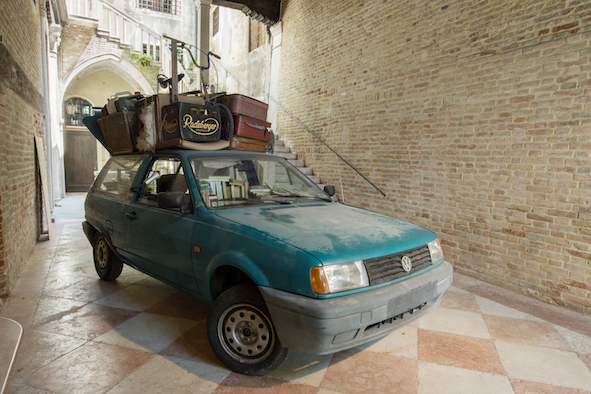 Downstairs, in the courtyard of the Palazzo Donà Brusa, Manaf Halbouni – an artist of Syrian-German heritage born in Damascus and based in Dresden – presents a different kind of vehicle in his mixed media installation Nowhere is Home (2015). Here, a dusty Volkswagen has been fitted as a mobile shelter for the contemporary nomad, complete with a small bed, library, and gas cooker. This work veers towards a lyrical vision of nomadism as a self-sufficient form of ‘struggle against the slavery of belonging to a nation, an identity, and a people’; a struggle problematically posited, as TJ Demos observes, by Michael Hardt and Antonio Negri as ‘entirely positive’.7 Halbouni even suggests his nomad-mobile could offer an option for coping with the hardships of life in the Western megacity; ‘It could happen to anybody,’ he says in a recent interview, ‘even people in London, if you break down and don’t have money to pay rents in the city… you have to find something you can live in’.8 But countering the romanticism of the imagined autonomy offered by nomadism are numerous cultural identifiers – mainly books – both in German and Arabic. Like the other works in Dispossession, Nowhere is Home seems haunted by a longing for a ‘home’ that partly overlaps, but cannot be fully squared, with existing concepts of national belonging. 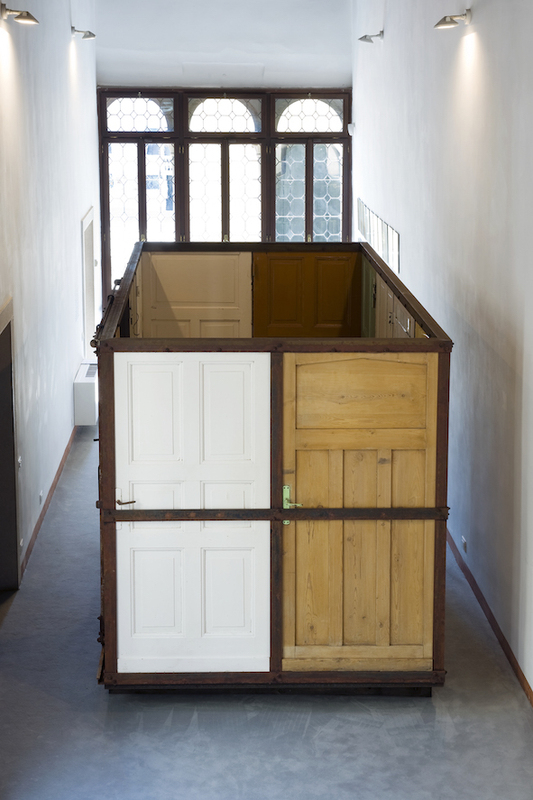 Dorota Nieznalska, Reisefieber, 2015, doors from houses on current Polish and pre-war German territories, dimensions variable, collection of the artist, photo: Małgorzata Kujda. Manaf Halbouni, Nowhere is Home, 2015, mixed media, dimensions variable, collection of the artist, photo: Małgorzata Kujda. In the past year, Halbouni has participated in counterdemonstrations against PEGIDA (Patriotic Europeans Against the Islamisation of the West), an organisation that has been based in Dresden since its formation in October 2014. Dispossession features a photographic series entitled Lines of Flight (2015) by Susanne Keichel, which examines the divisive effect that PEGIDA has had on Dresden’s inhabitants. Here, the limits of representability, in both its capacity as ‘proxy’ and ‘portrait’,9 are suggested. On one side are politically sanctioned bodies, protected by riot police and represented by public figures such as Dutch right-wing politician Geert Wilders (featured in Keichel’s series speaking at a PEGIDA event). On the other, the unrepresentables: Dresden’s population of illegal immigrants, who must remain invisible for their own protection. The question of how to ‘represent artistically a life severed from representation politically’ is one posed by Demos in his book The Migrant Image.10 Keichel’s response is to do so indexically. Slept-in beds at an asylum centre; hands holding phones showing pictures of hazardous journeys; a flurry of colourful sleeping bags in the dark: these images speak of bodies that persist in spite of their expulsion from the visual-political order. In the complex multi-authored work Lighthouse for Lampedusa! (the exclamation mark turning the title into an imperative), Thomas Kilpper, Holger Wüst, and Massimo Ricciardo adopt a similar form of indexical representation. 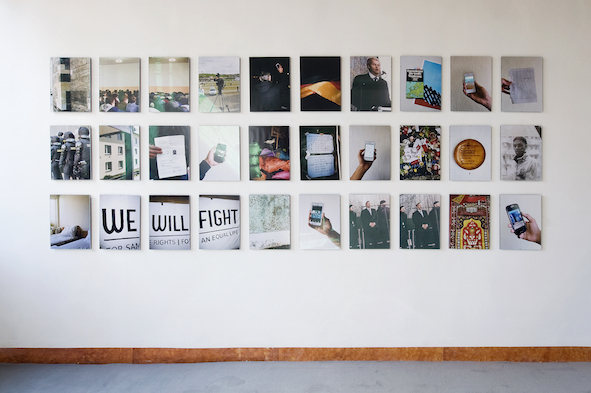 In the midst of their installation, which is plastered with photographs, newspaper clippings and scribbled appeals to ‘shut down Frontex’, the artists present a ‘Collection of Objects of Unknown Refugees’ obtained from the high court of Siracusa on Sicily. A compass, family photographs, mobile phones and notebooks warped by seawater: these serve a function similar to Keichel’s ersatz portraits, turning life as numbers into lives lived and felt. Susanne Keichel, Lines of Flight, 2015, C-Prints, dimensions variable, collection of the artist, photo: Małgorzata Kujda. Thomas Kilpper, A Lighthouse for Lampedusa!, 2008-present, presented as a multimedia installation featuring Holger Wüst, Venice Refugee/Non-citizen Protest Camp, 2015, video, and Massimo Ricciardo, Soccer Field, Lampedusa, 2013, photographic print on paper, dimensions variable, all collection of the artists, photo: Małgorzata Kujda. 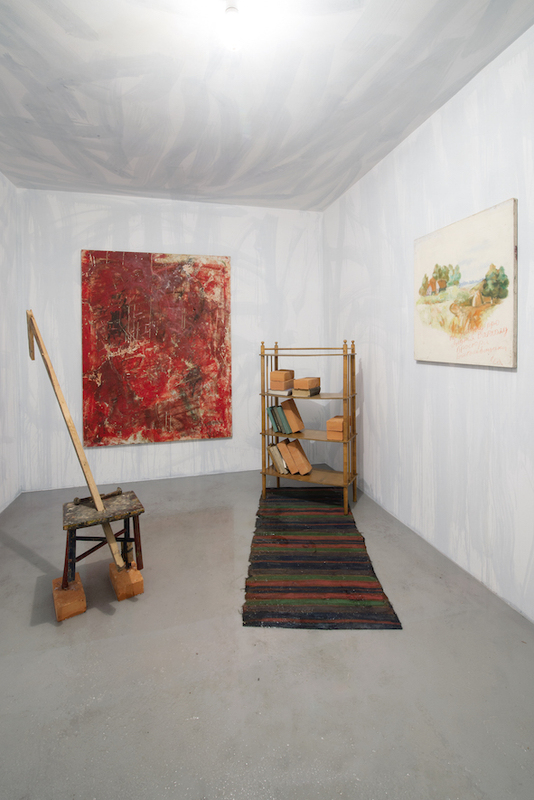 Andriy Sahaydakovskyy, A Room, 2015, multimedia installation, dimensions variable, collection of the artist, photo: Małgorzata Kujda. Sahaydakovskyy insists on the co-existence of emancipatory impulses with conflicting attachments to particular (nostalgic) place-myths. In a report from June of this year, the UNHCR estimated the number of forcibly displaced persons worldwide to lie at just less than 60 million;16 Agamben’s call to view the refugee as ‘the central figure of our political history’ retains its urgency.17 In putting the refugee at its centre, Dispossession goes some way towards answering this call, but it also produces a form of knowledge unavailable to the philosophy of law; an affective counter-history of the refugee experience that complicates the category of the citizen as much as it also proves this experience to be tragically entangled with, and impossibly imbricated in, myths of the nation-state and the imagined communities invoked by them. 1 The most comprehensive history of Wrocław available in English is Norman Davies and Roger Moorehouse’s extraordinary Microcosm: Portrait of a Central European History, Jonathan Cape, London, 2002. For a study of the transition from Breslau into Wrocław, see Gregor Thum, Uprooted: How Breslau became Wrocław during the Century of Expulsions, Princeton University Press, Princeton New Jersey, 2011. 5 This is Agamben’s concept of vita nuda, elaborated in Homo Sacer: Sovereign Power and Bare Life, translated by Daniel Heller-Roazen, Stanford University Press, Stanford, 1998, and other texts. 6 Documenta 11, curated by Okwui Enwesor in 2002, could mark an initial instance of this tendency. More recently, TJ Demos’ 2013 study, The Migrant Image, takes Agamben’s biopolitics as its theoretical framework. 13 Ibid, pp 19–20. An intimation of this crux lies in the ambiguity of the title of the foundational document for universal human rights, the 1789 Declaration des droits de l'homme et du citoyen, ‘in which it is unclear’, writes Agamben, ‘whether the two terms [‘man’ and ‘citizen’] are to name two distinct realities or whether they are to form, instead, a hendiadys in which the first term is actually always already contained in the second’, p 20. Kristina Rapacki is currently completing her doctoral thesis at The Courtauld Institute of Art. She was a 2014–2015 Helena Rubinstein Fellow in Critical Studies at the Whitney Independent Study Program in New York, and is an editorial board member of immediations.